School is very close to Springdalian hearts. 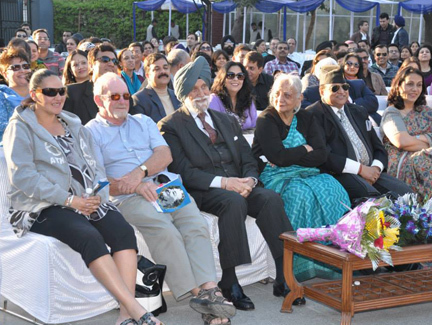 The OSA came into being in the early 70’s and now is a vibrant, energetic and resourceful body, of over four thousand members, which is regularly engaged with its Alma mater to enrich the students experience in multifarious fields. The love for the school has ensured that OSA has not just blossomed as the leading Alumini association in the country but has also become a very important social media for all ex-Springdalians. 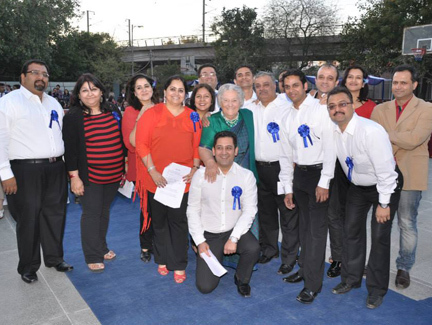 At OSA events, there is merriment all around when old friends meet, dine and dance together. The bonhomie at these get-togethers is unbelievable. Please contribute house hold items, anything in good condition not being used either at home and lying idle for the good of the community example old clothes, shoes, bags, toys, water bottles, stationary, note books, crockery etc. These items will be utilized to benefit the members of the poor society. Contributions may be sent to the following latest by 2nd Sep, 2014. As part of the Diamond Jubilee celebrations of our beloved Alma Mater, Old Springdalians Association, amongst other activities, is planning to launch an Android / IOS App to increase global connectivity and keeping the Springdalian family together. For this purpose we invite Old Springdalians from the IT sector with skill set in coding the APP and/ or coding in css3/ html5 and/or php/mysql to come forth and volunteer for the project/s. Its always an honour and priviledge to do the little one can, for one's alma mater. Smile- it lifts off weight of drooping lips, you save on wrinkle lift creams! Give benefit of doubt-it takes mind to green tea area, light and cleansed! Do not lose your cool-it keeps you from choking on your own bile! Let go of bad memories-it makes life SARAL, less columns filled! Love freely-its good for clogged arteries, better flow of blood through a charged up heart! Finally...Live..yes, after having done all the difficult tasks mentioned above, treat yourself, you deserve every bit of it! Get set go for the Diamond Jubilee! The Annual General Meeting of the OSA for the year 2014 is to be held on Sunday, 24th August 2014 at 10.30 a.m. at Springdales School, Dhaula Kuan. All OSA life members are invited to attend and give their inputs and suggestions. The term of the present Apex Body and Governing Body of the OSA, comes to an end. We will be constituting a new body for the year 2014-16. The self nomination form for the Governing Committee is available at the OSA office and can be collected from 8 a.m. to 2 p.m. on all working days from 1st August to 8th August. Completed forms are to be submitted by the 15th August, 2014. Please do send in your confirmation by email at osaofficedk@gmail.com. Looking forward to seeing you at the AGM. Hope you are already aware of the ‘Welcome Ball 2014’ and would be excited to reunite with your batchmates in a fun filled night for reminiscing those wonderful memories and friendships again. and celebrate those growing up years again!! We hope you all are all set to celebrate the 50th Year of the First graduating batch of Springdales ie the Golden batch of 1963 and having a reunion with your fellow Springdalians. We look forward to having you and your spouse at the bash. Its time to party! As we bid adieu to winters and await the sweaty summers, its just the right time to put on our party shoes and get together to celebrate life. Springdalians! get ready to put aside your worries and stress and prepare to have a swell time with your school mates and make it an evening to remember. As the year is barging ahead to touch the finishing line, it is being chased by winds of change. The atmosphere is rife with voices of passion. Never before were "The People" so vociferous about their ideas and ideologies. The yolk of inertia and inaction has been collectively discarded. We voted-we got noted. We expressed-we got our point impressed. This then, shall be the path to evolving-of self, of polity, of nation. The ball of change shall gather momentum, no doubt. Lets reflect on the outside and introspect within, to bring about optimum positivity-for the world at large, and, the world within. The Delhi Schools Literacy Project (DSLP) was started in 1988, under after the National Literacy Mission, with the initiative of Mrs Rajni Kumar with an objective that schools and school students play an active role in the eradication of illiteracy. The coordination centre of the project was set up in Springdales School, Dhaula Kuan. The project has been successfully running for the past 25 years and more than 103 community-services oriented schools are members of this socially relevant project and out these 45 schools are very actively working in slums of Delhi. 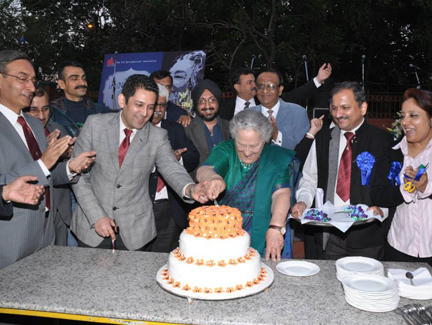 The project celebrates its Silver Jubilee this year. OSA - Literacy Mela : 14 Sep 2013. Sad to inform you of the demise of Mr. N. Tangri former Principal, Springdales School, Pusa Road on 13th August 2013. Tangri Sir, was a part of Springdales School for 32 years and was Principal from 1988 to 1992. His wife Mrs. Tangri was our highly respected teacher. Springdales School is organizing a Memorial on Thursday, the 22nd of August 2013 at 12.30 p.m. at Springdales School, Pusa Road. Do join us at Springdales School, Pusa, to pay our homage to our dear teacher. Greetings to all and a very warm welcome to our newest entrants from the batch of 2012-13. I am sure the new live-wires joining the cadres of OSA are brimming with energies in persuance of their dreams and aspirations. To those who made it in attaining their "Plan A", congratulations and god bless, as you get to tread the path you meticulously planned for yourself. To those who have had to take up their "Plan B", congratulations and god bless, as destiny has given you a chance to tread a path that it has chosen for you! Have faith that this "Other Path"will give you a far greater scope in developing newer skills and bring out latent talents, as you will be broadening your horizons by learning new subjects and experiencing situations hitherto unknown to you. Afterall, one can be as elated or as disappointed as one chooses to be! Life is full of options,all we need to do is embrace each opportunity with conviction and positivity. Your success may come from unconventional quarters,but success it shall be! Sunday, 4th August 2013 at 10.30 a.m. at Springdales School, Dhaula Kuan . As OSA grows in numbers, its programs become more varied reaching out to a larger age-group than ever. We would appreciate the participation and suggestions of the young and the not so young Old Springdalians. 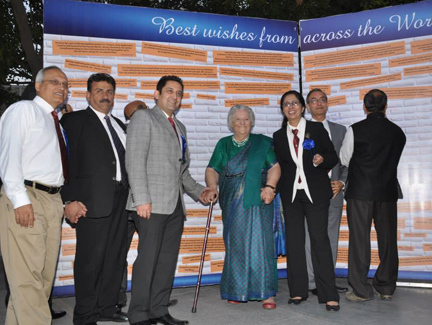 As our Dear Mrs. Kumar, the 'Brahma' of 'The Great Springdalian Epic' touches the momentous milestone of 90, let us all gift her with our collective resolve to be spirited participants in the process of change that the nation must undergo in order to make this world a truly fearless and united family. Let us perceive and then achieve a society which we shall be proud of passing on to our next generation. E COMMUNIQUE Feb. 2013 - As our Dear Mrs. Kumar, the 'Brahma' of 'The Great Springdalian Epic' touches the momentous milestone of 90, let us all gift her with our collective resolve to be spirited participants in the process of change that the nation must undergo in order to make this world a truly fearless and united family. Let us perceive and then achieve a society which we shall be proud of passing on to our next generation. 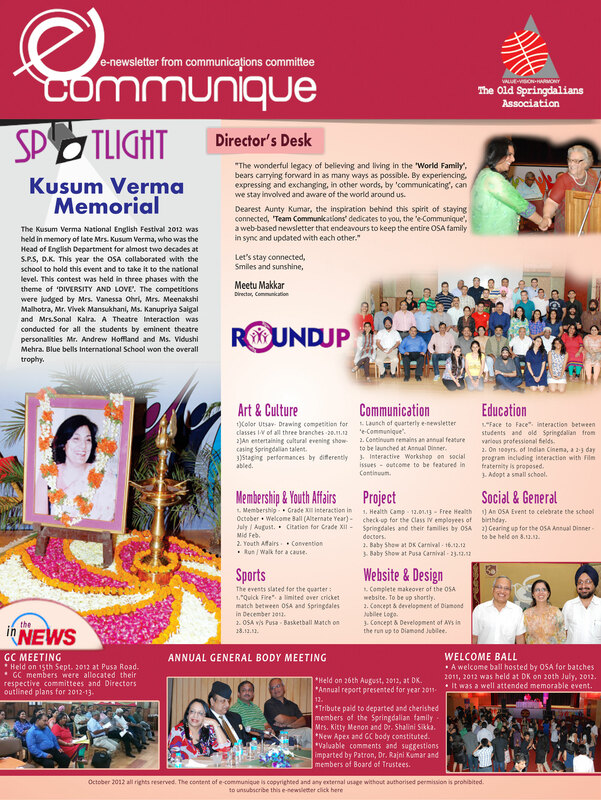 Our dear Patron Mrs. Kumar turns 90 and we are privileged to be a part of this grand celebration. The Old Springdalians' AssociationÂ takes great pleasure in inviting you and your spouse for a"High Tea"
It is with immense pleasure and pride that we inform you about your Alma Mater going global. SPRINGDALES is opening up it's first international branch in Dubai. The launch of SPRINGDALES DUBAI, will be taking place in the month of February, and I take this opportunity to call all Old Springdalians based in any part of the Emirates, to please connect back to their alma mater and be a part of this historic step. Do get in touch with us. Its timeÂ to BLOCK YOUR DATE for the most desired and awaited event in the history ofÂ all OLD SPRINGDALIANS. The year that has gone by meant different things to different people. It was as if pursuing a dream woman /man with a predictable frustrating uncertainty but with undying hope! The year gave us moments to cherish, reasons to give up & reasons to go on. This year gave us Indians lot to be ashamed of as a country, as citizens and as a society. But the positive is to look forward to hopefully a more responsible and awakened Indian in each one of us. There is hope. Hope of positivity and hope of doing something nice and big. As long as we continue to Believe in ourselves and our work, try hard to achieve our goals, live our dreams and be passionate about our life, while availing opportunities that come our way. items will be utilized to benefit the members of the poor society. Contributions may be sent to the following latest by 5th Sep, 2012. The Annual General Meeting of the OSA for the year 2012 is to be held on Sunday, 26th August 2012 at 10.30 a.m. at Springdales School, Dhaula Kuan. Congratulations to the batch of 2011-12 for the excellent result. I am sure Springdalians wherever they go will shine and achieve their dreams. We welcome and invite you to join us for a Batch Reunion party for batches 2010-11 and 2011-12 on 20th July at Springdales School, Dhaula Kuan. 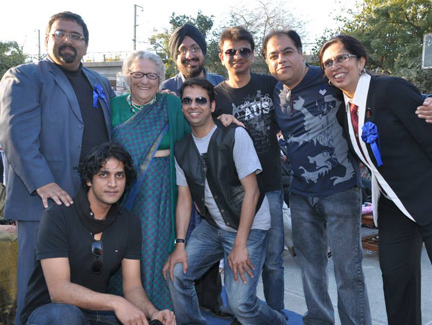 It is time for the much awaited OSA annual picnic which we all look forward to each year. Its time to bid good bye to winters & welcome the spring at the school farms with fun & games along with soft beverages & Lunch. This picnic will be all the more special as we celeberate our mother, mentor & guide, Mrs. Kumar's 89th birthday & celebrate the journey of a great soul, who gave shape to our minds & meaning to our lives. Thank you for all your messages, cards, emails, letters, flowers and other expressions of love congratulating me for the Padamshree. They have meant more to me than the award itself. I am looking forward to meeting you with your family at the OSA picnic on Sunday, Feb. 20th. It is my earnest request not to bring gifts or flowers - only the gift of your presence. But any contributions for the OSA Scholarship fund for the education of the weaker section at springdales would be warmly welcomed. "Tum Samay Ki Ret Par______"
It is the time of the year to celebrate winters & togetherness. After the grand success of Homeward Bound where nostalgia rose to its peak, the Springdalians are ready to reunite at another grand event. OSA invites old Springdalians for an exclusiveÂ Gala Annual Dinner for a lively evening of fun, good Wine, Dine & Dance. The OSA AGM is scheduled to be held on Sunday 22nd August at 10.30 am at Springdales School, Dhaula Kuan. Riding on the success of the past years & the rising strength of the organization forces us to rethink of new pathways that we must take in order to strengthen the role of the association not only towards the well being of its members but also society at large. The Annual General Meeting of the OSA, reflecting over the past and planning for the years ahead, will be held on Sunday 22nd August at 10.30 am at Springdales School, Dhaula Kuan. Thank you for registering for "Homeward Bound". We are looking forward to welcoming you back to school at the assemblies in Pusa Road / Dhaula Kuan as the case may be. All old students are invited to see the exhibition on Springdales down the ages which has a special section on Old Springdalians and the OSA. at 11.00 am in the hall of Friendship & Peace at Springdales School, Dhaula Kuan, New Delhi. Homeward Bound - The most memorable event of our lives! An OSA initiative to bring together & celebrate, four generations of Springdalians, who flew from the nest. A full day picnic with lots of adventure sports, badminton, boat ride to the island, tambola, music, dhol wale and off course lunch and chai pakoras in the evening. It's the time to meet again, renew old friendships and rejoice at the new ones. Scheduled on the 27th december, 2008 at Kamal Mahal, Mauryas, the OSA gala dinner is the focal point of our association's fellowship programmes, our mega get together where we celebrate all the happy times that we've shared at school. It's the school birthday, the fete, the annual day, the farm weekends, the summer trips all rolled into one. It sure can't get any bigger. As an old Springdalian, it's also time to share with our spouse a little of our days in school and meet our old teachers. a Foot ball match "OSA VS Springdales, Pusa Road" on 3rd December 2008 at 9:30 am. All site material is owned by Old Springdalians Association and should not be used without prior permission. Any views expressed in message boards and members notes represent the opinions of the author, and do not represent the opinions of Old Springdalians Association.